Our 7-Day Intensive Course runs for a straight 7 days and is popular with Overseas students and those living outside of London who want to learn as much as possible in as short a time as possible to save on accommodation costs etc. It is fast-paced and hard work but extremely rewarding with rapid progress in skills being mastered. If you have any feedback, requests or suggestions please use this contact form to get in touch. Morning Session: Step by step instruction on how to whip for wig foundation making. Once the basic skill is mastered we will work on whipping seams and darts then learn how to repair tears and holes. It is advised that anyone not familiar or competent in whipping completes this one day course prior to enrolling on the three day Foundation making course. Afternoon Session: Step by step instruction on how to knot hair for wig making. Here we will cover forming the basic knot and then move onto straight, directional and cross knotting. It is advised that anyone not familiar with wig knotting completes this one day course prior to enrolling on our ‘Knotting a Wig’ course to enable them to start the course with the necessary skills and understanding. All materials required on the day will be supplied. Learn how to take detailed headwraps and measurements then use these new skills to pad out a headblock to accurately recreate your client’s head shape. This is the important first step of wig making and we will take you through it step by step. Step by step instruction from preparing the client, taking head measurements, creating a head wrap and padding the head block to laying on the lace and then whipping it to create a lace front wig foundation including springs. Students will be given a boxed starter kit* containing all they need for this wig making course which they keep at the end. Three consecutive Sundays which is aimed at those working in the West End who have limited days off. For those of you already familiar with headwraps, padding out blocks and whipping we offer a two-day wig foundation course where Philip will take you through each stage of crafting a handmade, hand stitched, made to measure, lace front wig foundation. 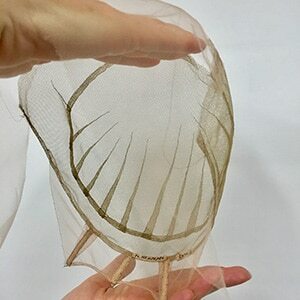 This is designed as a following on course from Wig Making: The Foundation where you will have made a lace fronted foundation and be ready to knot into it. This course covers step by step instruction on how to knot the hair into the foundation to produce a hand-knotted lace-fronted wig, looking at hair directions, knotting a parting and fine hairline knots. Cost: £200/day – duration as many days as you feel you require, charged by the day. Students are expected to progress their wig at home in between course days. Join our three-day course to learn how to take accurate face wraps, make templates, understand knotting directions and create a variety of pieces of your choice during the sessions which you will also cut and dress. Knotting skills are essential for this course! Beginners course covering preparation of your client’s hair, including, pin curls, wrapping, use of springs and toupee clips. 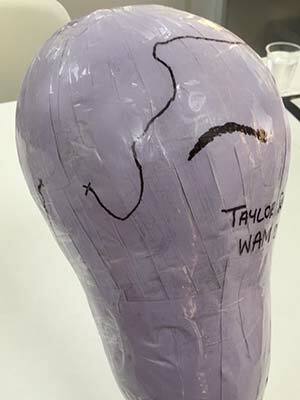 How to correctly apply a lace front wig, pinning it on, gluing and then refining the wig dressing so the wig and style looks completely natural. We will also look at removing the wig, cleaning the lace and the correct way to block it up ready for redressing or setting.